This is the weekend before Christmas and this month seems to have flown by. We've done most of our gift shopping online this year and are still waiting for a few of them to arrive, but this is in the hands of couriers or the postal service so there isn't much we can do about it. Instead, we're settling in to enjoying the festive season proper and that means lots of family time. Today started slowly as usual, but with plans for some carol singing this morning. We are in the habit of being out of the house fairly promptly on Saturday mornings for M's dance class, even so we were maybe 10 minutes later than I'd have liked for heading out. We were greeted at the local common by the pastor from across the road who was bearing a tray of extremely cold 'hot' non-alcoholic mulled wine and mince pies. M didn't recognise the mince pies for what they were and helped herself, while I took one sip of the cold mulled wine before handing it over to Dave to finish off. Dave left us too it, so M and I made small talk. I finished M's pie when she discovered the filling was not to her liking and M found a biscuit to eat instead. Dave still hadn't returned when the singing started, so we muddled through as best we could. M was asked which carol she'd like and duly suggested Jingle Bells, which everyone agreed was a good choice for such a frigid morning. And boy, oh boy was it cold today! We sang along and M joined in, obviously very pleased her suggestion had been taken seriously. M's next suggestion was Away In A Manger, which went well too. After a while we made our apologies and said thank you, before heading back to the car to try to warm up. Dave was standing by the car, having walked to a local supermarket in search of quiche for our lunch. We bundled into the car to drive over to Toft Alpaca Farm who were having an open day today. We've been before so knew the format, but excitement was in the air as M anticipated seeing alpacas. Alpacas outside the cafe and visitor centre at Toft. We arrived much later than I'd hoped, so decided against going on a walk about the farm, instead choosing to stay close to the cafe. M played outside on the lawn or near the pond, with one of us in close attendance as she did so. Friends of ours showed up. We chatted. Had lunch. I bought some knitting needles. Father Christmas showed up on a tractor which amused M no end, especially when he dropped his bucket of sweets! And then we walked an alpaca, the highlight of the visit. We've done this before, so I'd already primed M with the do's and don'ts. The introductory talk was much the same as usual. Do not get near the hind quarters or put your hand up the alpaca's bottom. While not aggressive, if surprised alpacas will kick and although unlikely to result in broken bones, it will hurt. If your alpaca tries to break free, let go of the lead. Do not try to hold on or you may be dragged off your feet. The area the alpaca is being walked in is fenced in, there is nowhere for the alpaca to go and a staff member will retrieve it for you. Do not wave your hand towards the alpaca's head, they don't like it and will shy away. Instead, bring your hand in from the side and under the head to stroke the neck or shoulder. 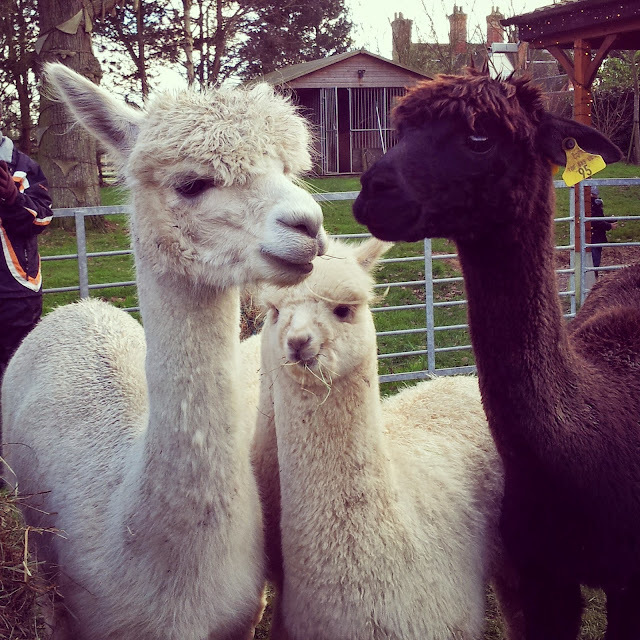 Alpacas like fuss and cuddles, taking lots of them providing you don't startle them. M chose a small, white alpaca this time; previously she has chosen feisty animals so it was a bit of a relief to get a rather placid one today. We walked and other than stopping to stare at its friends every time we passed the neighbouring field we did OK. When the alpaca froze, I'd give it some fuss and make encouraging sounds which would get it moving again. 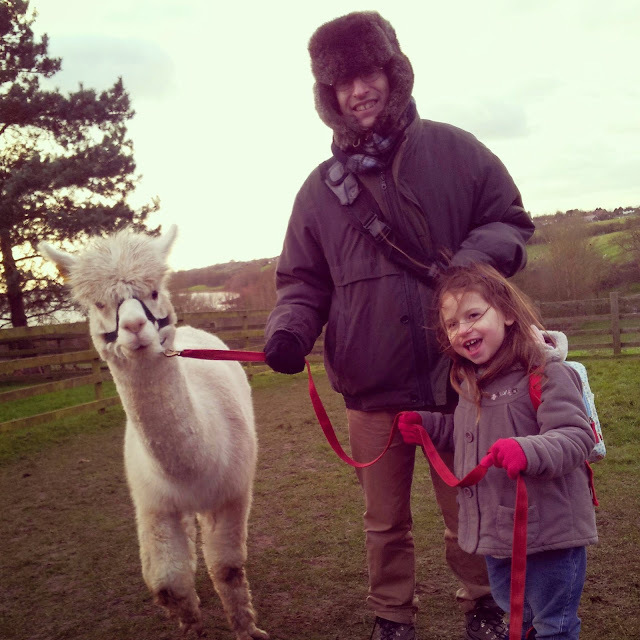 Walking an alpaca is the highlight of a visit to one of Toft's open days. M was ecstatic. Even her hat falling off didn't dampen her spirits, although the poor girl looked frozen after fifteen minutes of leading an alpaca around a field. We led the way inside towards warmth and a hot chocolate, much to M's approval. It seems we were not the only home educators present, as we were recognised by one family and I spotted another one, nodding a greeting. M was very enamoured of the stripy paper straws that came with our hot chocolates, which it has to be said were not that hot but went down very well regardless. The straws reminded M of Humphrey's ("Watch out, watch out, there's a Humphrey about!") and she insisted on taking a straw home with her. The straw was used in a project to build a Humphrey later this afternoon. We sat and drank our chocolate, making room for another family at our table where we talked about knitting, toys, dinosaurs, Christmas and how much fun we'd had on the farm. M played with some toy horses she'd been carrying in her backpack all day, the horses gaining some admiring comments from the folks we were sharing a table with. I did a few rows of crochet. It was nice. At home, an exhausted but mentally buzzing M designed her Humphrey while we brewed tea, then we all finished the afternoon with a piece of home made gingerbread cake that M and I had made yesterday. The cake was yummy, hitting the spot with all of us. In all, a good if very cold day.